I did this program last semester and it was so amazing that I decided to do another – this semester was even more amazing. I loved the city, the math & most of all the people. I am so thankful for this opportunity and would definitely recommend it to anyone. Math in Moscow, much like any other study abroad program, is what you make of it at the end of the day.There are great courses available at IUM and at HSE, as well as miscellaneous seminars and conferences that may be interesting. My advice is to take it as an opportunity to try something new in mathematics, such as a new topic, a new branch, or a new style of a course you’ve already taken. 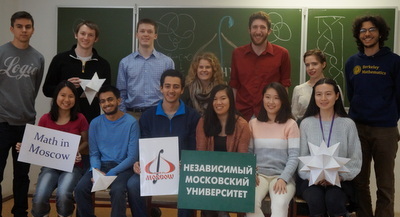 I feel really lucky to participate in this program and live in Moscow for one semester. Even though I have been studying abroad and learning math for 2.5 years before I went to Russia, I did learn and improve a lot both academically and mentally after 3 months. The professors and tutor are really nice and supportive, they not only exhibited me different ways of learning math, but also gave me advice and helped me find resources for my interested research field. Also, Moscow is a really artistic and interesting city, it’s a good idea to explore this city and Russian culture when you want to have a rest. I think the program was fantastic. To forgo the mathematics for a second, my experience in Russia was phenomenal. The level 2 and 3 Russian courses were taught by a fantastic, helpful, and enthusiastic professor (Dasha), who really helped me see the logic in the Russian language. By the end of the semester, I felt like I could actually come up with new sentences and phrases. Additionally, she would speak quickly to us (which I think was good for learning), but it became very evident that she was being very careful with what she was saying so that we could understand most of it, and explained words we didn’t know before we even had to tell her we didn’t know them! In regards to the Russian language and culture, being in the capital of Russia was the best possible learning opportunity. People on the street don’t slow down or avoid slang. Of course, everyone I met there was very receptive that I was a foreigner and would try to converse with me, but hearing the way they say things and seeing how they do things was immensely helpful in trying to adapt to Russian life for those four months. Additionally, there were many friendly people around the dorms: people working at the food stands, grocery stores, or the hair cuttery that was a minute away; they were all incredibly nice. Having a comfortable home environment, as well as having a metro card to explore the city (there was so much to see! And much I learned I missed…but I’ll save that for next time! ), made for a very enjoyable stay in Moscow. We also went on a few excursions: I personally went to both the Vladimir/Suzdal and Saint Petersburg trips. Again, these were incredible! The Saint Petersburg trip was very interesting, as we saw many royal palaces, museums (the famous Hermitage, and more), and other notable spots, as well as just exploring the city ourselves each night! The trip to Vladimir/Suzdal, rightly left by our guide named Vladimir, was so much fun! Our guide was hilarious, and made the trip immensely enjoyable. Seeing the old Russian towns of Vladimir and Suzdal with him was so much fun and very educational. The Russian architecture was absolutely beautiful! (That statement applies not only to those towns but to essentially every Russian monument/building/church we saw). Finally, the math. It was incredible. It became very obvious that these classes would not be a walk in the park. We had incredibly intelligent professors whose own research was in the topic they were teaching. I took Algebraic Topology, Commutative and Homological Algebra, and Algebraic Geometry. The commutative algebra and algebraic geometry worked with eachother very well, and the homological algebra and algebraic topology had a beautiful interplay. These classes were incredibly hard, and yet after putting in a week’s worth of work every week, I feel like I’ve really internalized the material. Though I enjoyed every class massively, I absolutely fell in love with Algebraic Topology. This course was taught by Dr. Alexei Gorinov, whose homeworks were inspiring. We began solving the homeworks by working a problem at a time, but as the weeks went on, we discovered beautiful interplay between the questions. One thing we did two questions back help here, and that combined with the last question gives us the next result! It read like a novel. In that class, I feel I not only learned the material, but I learned the intuition and I gained a thinking process. I hope to go to graduate school to study Algebraic Topology. Overall, I thought the program was absolutely incredible. I will be strongly encouraging other students at James Madison University to participate in this program. I am immensely grateful to have the chance to study in the MIM program. In terms of the mathematics and the class I took I was blown away by the quality of the professors and the amount of material covered in a semester by a number of the professors. Honestly there are average professors there as well (I had one that need to correct a handful of homework assignments) but they are on average as good as if not better than the ones at my home university and most people’s home university that I talked with. I feel like I matured much more substantially than if I had just stayed at my home university. I go to college very close to my house and to be this far away from home and in this kind of environment for so long was amazing. More than anything my favorite thing about the program was the community we developed and the ability to explain to someone very esoteric and complex theorems that excite you and get an excited response back. Oftentimes I would explain something to someone or have something explained to me not because it was part of the course but just because it helped with intuition or was mind blowingly interesting. I have never felt as if I was as truly part of a ‘math’ community as I have here. I would recommend this program to anyone seriously pursuing mathematics.